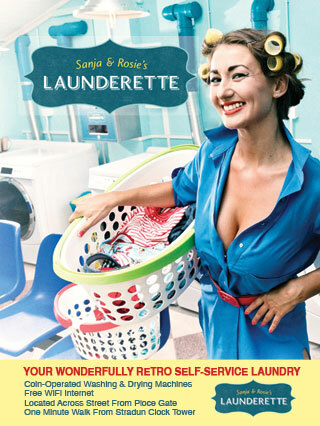 Sanja & Rosie’s Launderette is a self-service laundry. We can also arrange drop-off service for tour groups, production companies, and special events. If you require group drop-off service, please feel free to e-mail us at: info@dubrovniklaundry.com or give us a call at: +385.(0)91.896.7509. * Our machines accept 1, 2, 5, 10, 20, 50, & 100 HRK (Croatian Kuna). * Washing detergent and WiFi internet is provided free of charge.